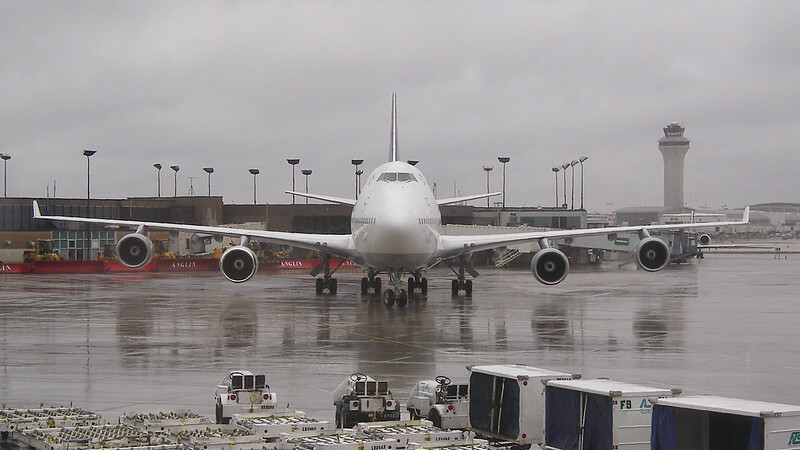 Background: My favorite airplane is the Boeing 747, a classic widebody operated by airlines around the world. Unfortunately many airlines have begun retiring their 747s, which means that the time to fly on them is now! My mission is to fly on 747s with as many airlines as possible before it's too late. This year I planned a trip to go to the Oktoberfest in Munich. 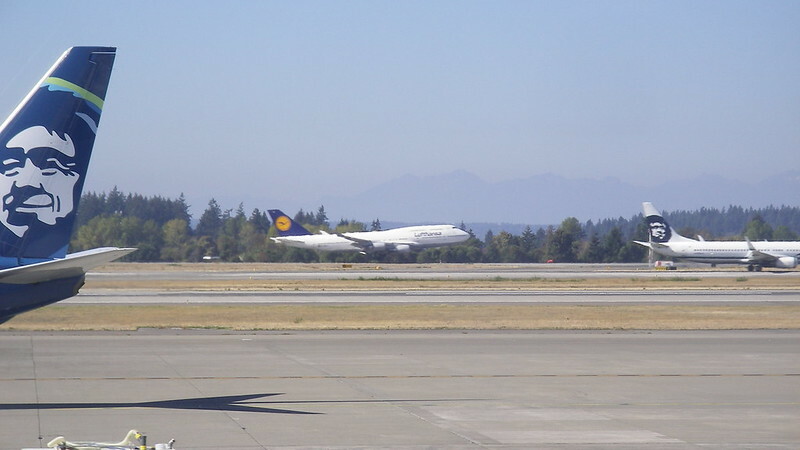 The proper way to begin a trip to Germany is of course by flying the Lufthansa, the German flag carrier. 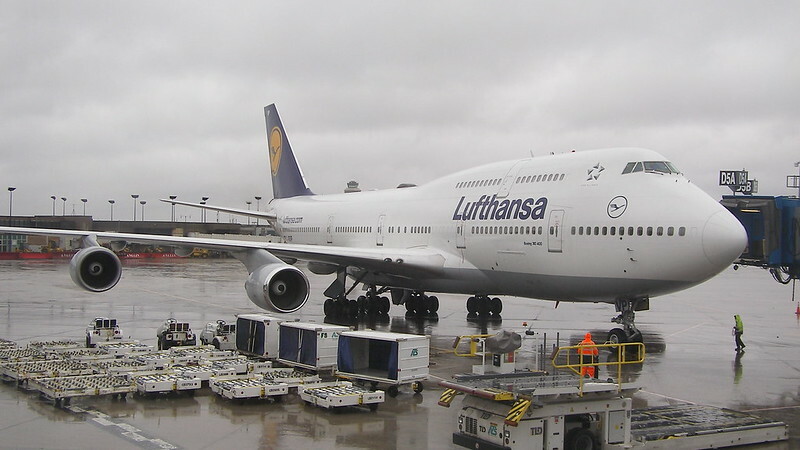 I'd previously flown Lufthansa on short European segments, but this would be my first time flying them longhaul. 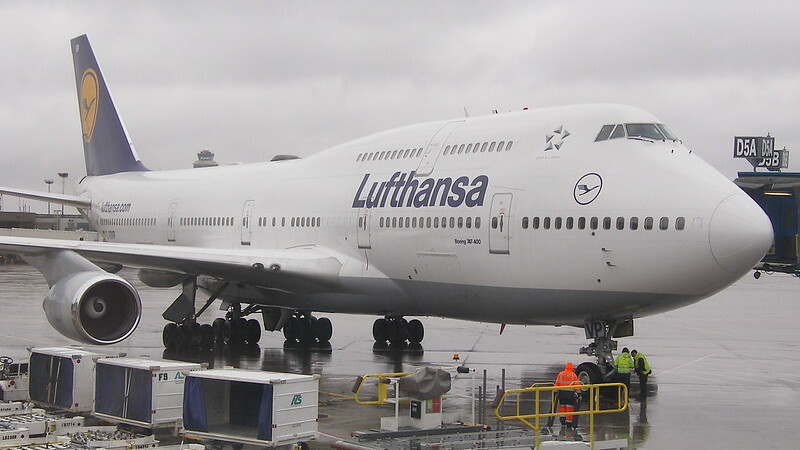 The 747-400 would naturally be the best way to fly Lufthansa longhaul for the first time. 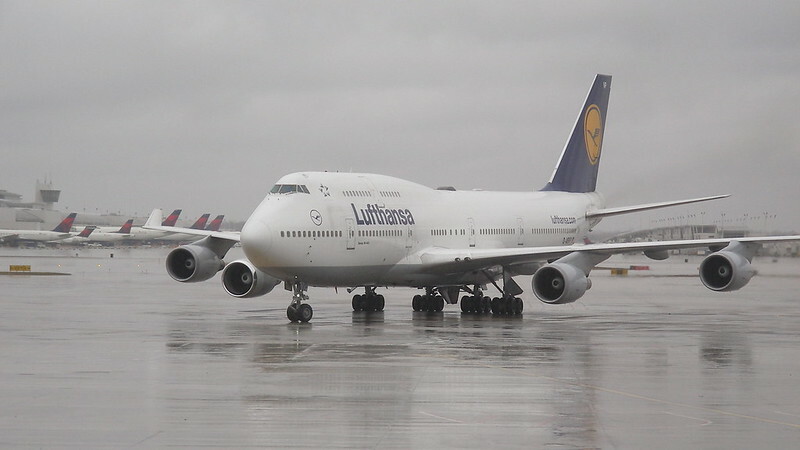 Lufthansa sends their 747-400 to the North American destinations of Denver, Detroit, Orlando, Seattle, Toronto, Vancouver, and Washington (with some flights only offered seasonally). Based in NJ, I find the short east coast flights to Europe aren't long enough to fully enjoy the experience and get a good night's sleep. For this reason I often try to find longer segments departing from cities farther west. I've previously flown Newark to London via Denver, and Philadelphia to Amsterdam via Houston. This time I thought Newark to Frankfurt via Seattle sounded just right, and by booking almost nine months in advance, I got a great price through Kayak. 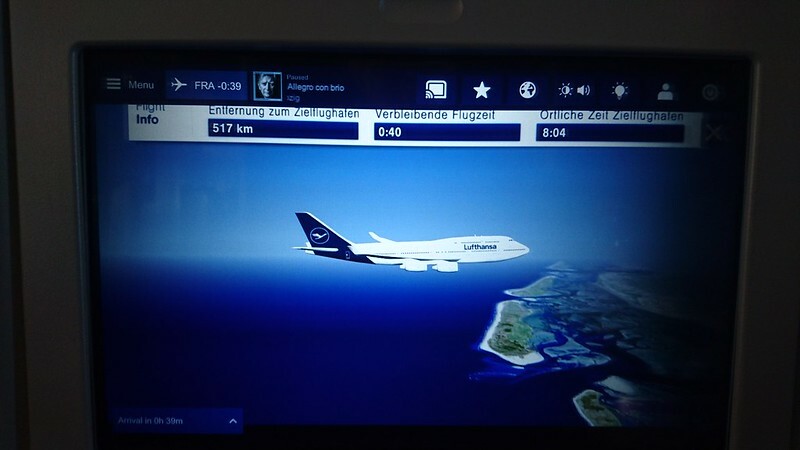 I couldn't wait to try Lufthansa longhaul for the first time, with a nice long flight on their 747-400. 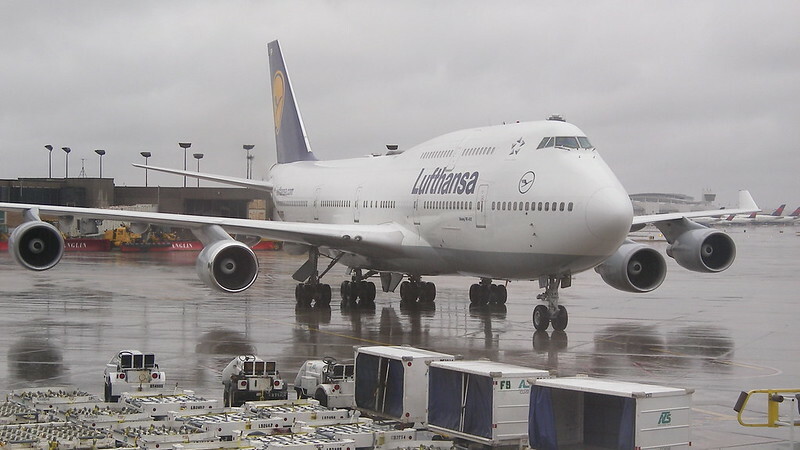 I later arranged an additional trip to Brussels, and with the Lufthansa 747 still on my mind, I looked for another 747 routing through Frankfurt. This time booking only one month in advance, and considering the limited LH 747-400 route options, it was more difficult to find good fares. 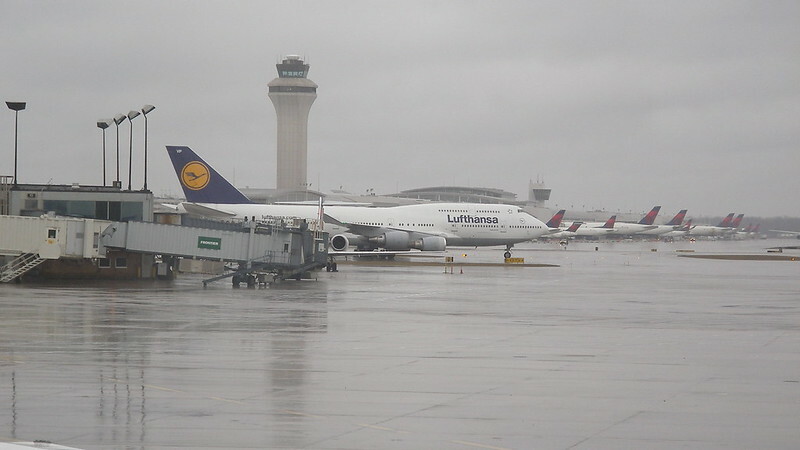 I finally noticed that NYC-FRA flights were being offered at good prices, and I was able to take advantage of those fares while booking my outbound flight as a connection through Detroit: EWR-DTW-FRA, with DTW-FRA on the LH 747-400. 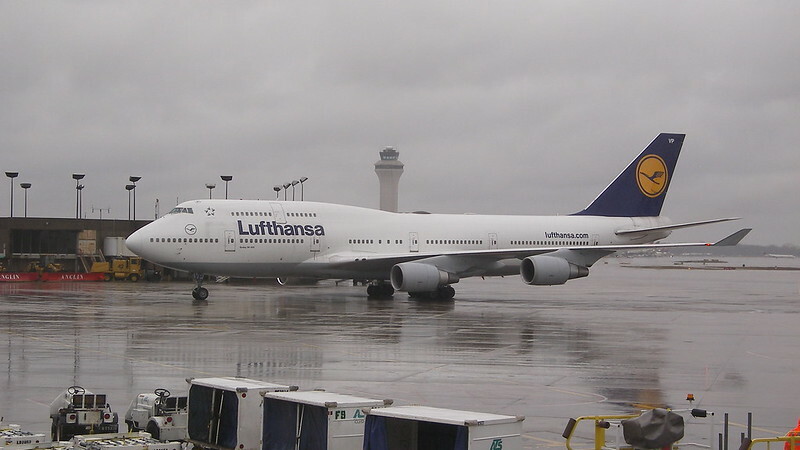 I was happy to get to fly on the Lufthansa 747-400 six months earlier than originally expected, and looked forward to comparing the short 4,000mi flight out of Detroit with the long 5,000mi flight out of Seattle later in the year. My day began in Newark on the 06:05 flight to Detroit. I specifically picked the first flight of the day so as to start the day very early, and hopefully be more tired for my 15:55 overnight flight with Lufthansa. I flew on a United Express E175, operated by Republic. The load was only nine people, and the flight attendants invited everyone to First Class once onboard. Very nice. We arrived five minutes early into the Detroit North Terminal. My Lufthansa flight was to depart from the same terminal. I went landside to get my official Lufthansa boarding pass on the classic Lufthansa cardstock. For the first time I received Precheck on a foreign airline, which was quite nice. I hurried back to Gate D5 to get a good vantage point for photographing my arriving plane. I got there just in time to see the Queen of the Skies descending out of the gray clouds of rainy Detroit as she came in for a landing. 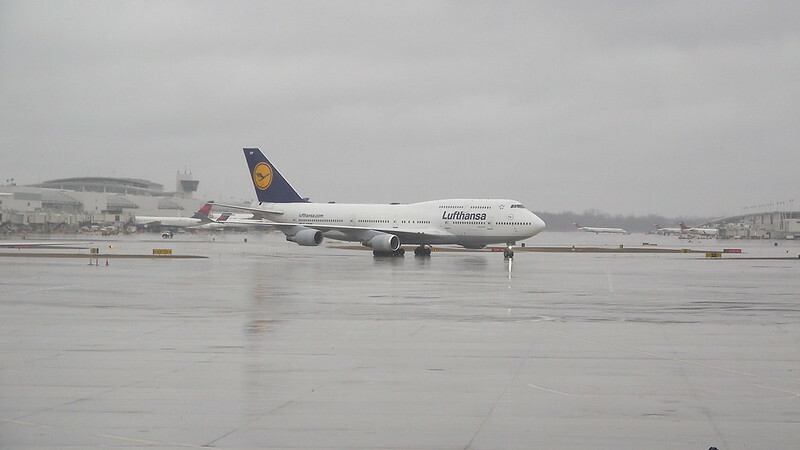 Seeing the unmistakable shape of the 747 arriving to Detroit really got my excitement going for my flight today. 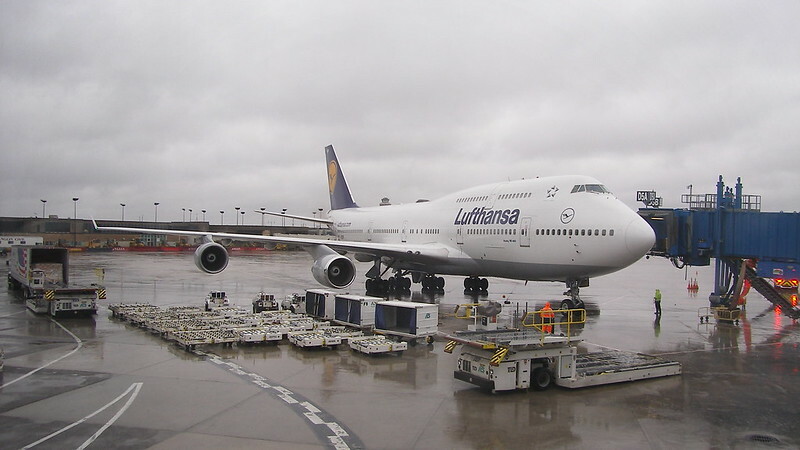 There's nothing better than an international flight, unless it's a 747 flight to a faraway destination. 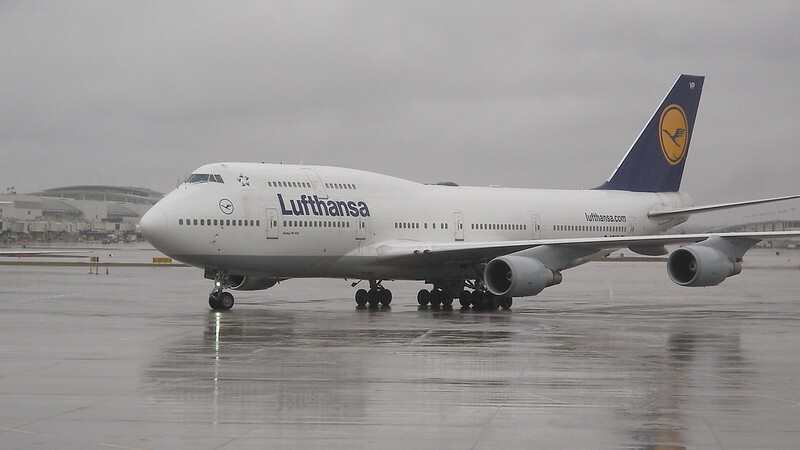 And today was even more special, because not only was it my first time flying on Lufthansa's 747, it was my first time flying Lufthansa longhaul. 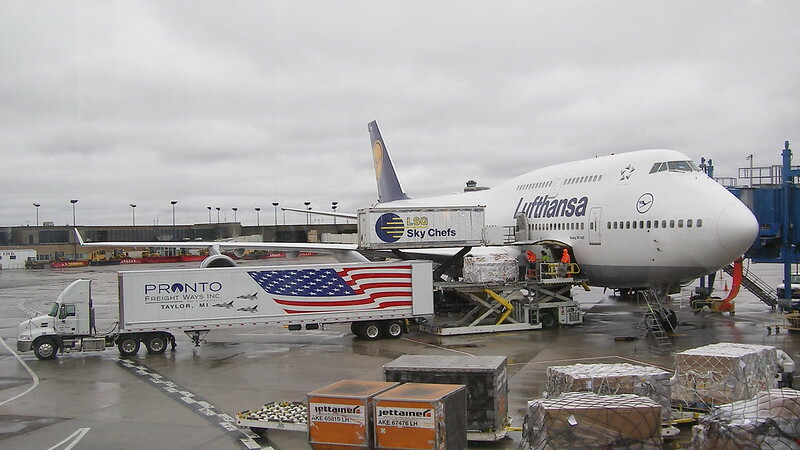 Clearly the only appropriate way to experience Lufthansa longhaul for the first time was on their 747-400! 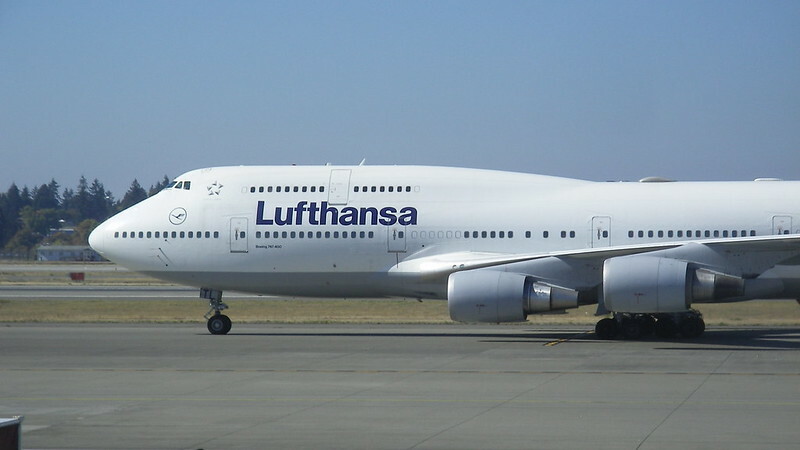 My aircraft was D-ABVP, a Lufthansa 747-400 dating to 1997. Having enjoyed watching the Queen arrive to the gate, I headed for the lounge where I could spend the next 2h. Boarding was set to start at 15:25, but the check-in agent had said it'd be more like 15:00. The lounge had a nice LH 744 model on display, but was very crowded. I headed back to the gate at 14:45 to find my aircraft being provisioned for the overnight journey to Frankfurt. Groups were invited to line up in their queues at 15:10. 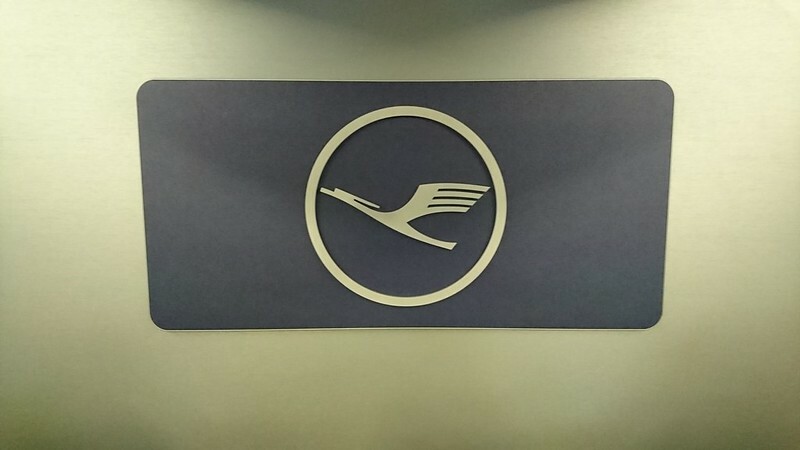 Two queues were set up at Door 5A, with the first queue designated for Star Alliance Gold and Lufthansa premier members, and the second queue designated for Business Class. Door 5B was set up for Economy by row number. Boarding began at 15:30 with Star Gold and premier members. No fewer than 100 people boarded. Many people left the Business Class line to join the early boarding group when they realized it wasn't being enforced. I was second in line at Door 5B, but ended up one of the very last to board into Business Class. The chaotic boarding continued all the way into Door L1, with the flight attendants too busy hanging passengers' coats to even say hello to the unfortunate late-boarders. 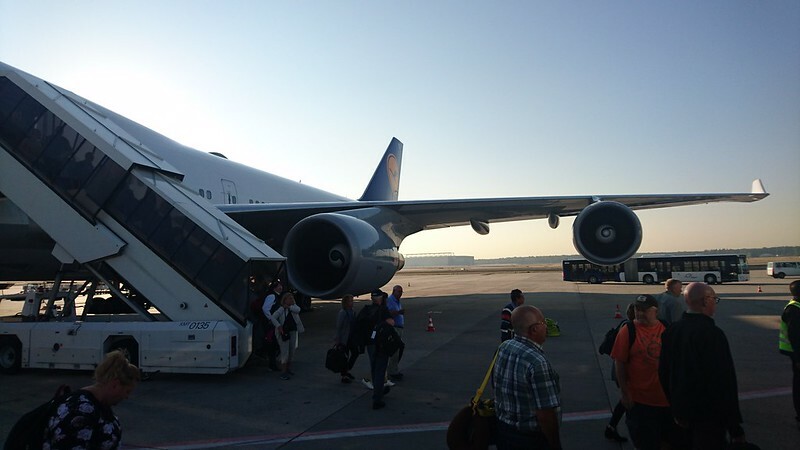 It was a disappointing start to my Lufthansa longhaul experience. 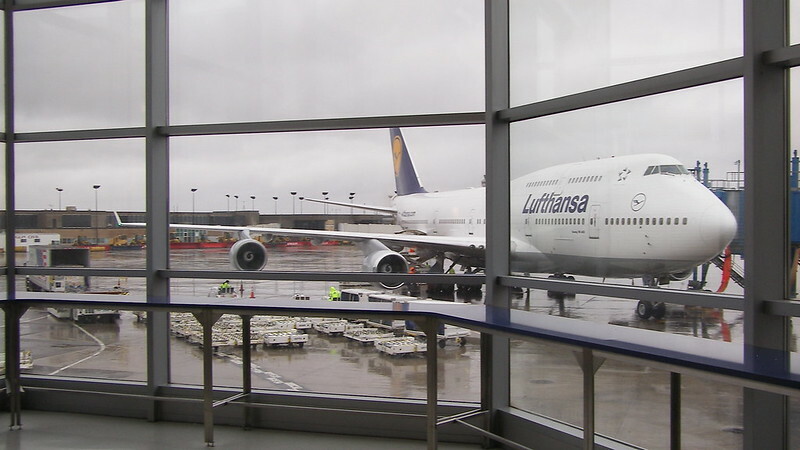 My routing of EWR-DTW-FRA had permitted me to take advantage of the good prices of the NYC/FRA citypair, but only by purchasing the Lufthansa flight as a United codeshare with a United flight number. Purchasing my flight as a codeshare resulted in an advance seat assignment not being possible, even by calling LH and providing the LH record locator. Very old school, low tech and frankly annoying, due to the presence of four undesirable middle seats in the LH 744. For comparison, KLM and Air France flights sold as Delta codeshares permit advance seat assignments, so I really don't understand why United and Lufthansa don't allow it. When checking in at Newark, only six seats were left in Business Class, and I was auto-assigned 10D. Upon initial inspection, 10D wasn't really my desired seat, but at least I had no more fear of a middle seat. Plus 10D offered a couple benefits, including the middle seat currently unassigned, direct aisle access, and large bulkhead footwells. I usually end up sitting in the nose or on the upper deck of the 744, so I thought I'd enjoy sitting in the 744 main deck cabin this time. Additionally, there was no option to conveniently change my seat once it had been assigned in Newark. I decided to keep my auto-assigned seat of 10D. 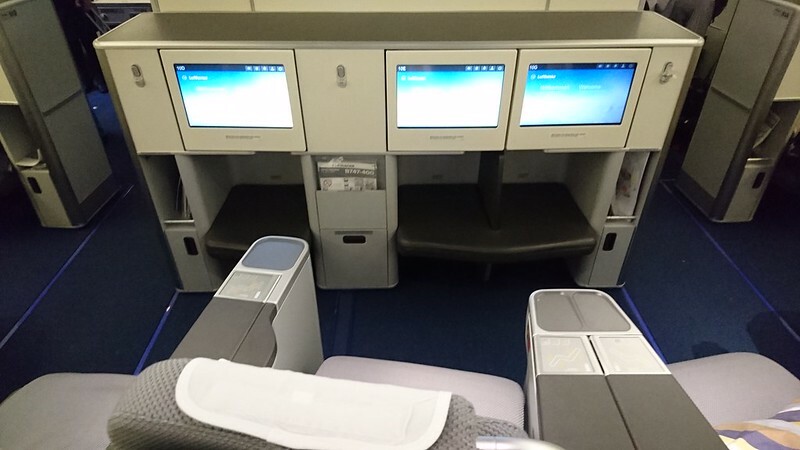 The main deck Business Class cabin is configured 2-3-2, and my seat was on the first row bulkhead on the aisle. The middle seat had been assigned since this morning, and we had a load of 100% in Business Class. Both seatmates were already seated. My seat was stocked with a pillow and blanket, headphones in a small compartment near my knee, and an amenity kit and bottled water in a small compartment near the footwell. I had a nice large footwell, and the seat had lots of small compartments for various items, but none were left over for personal storage. There were no overhead vents at any seat, but it was cool enough in the cabin without them. 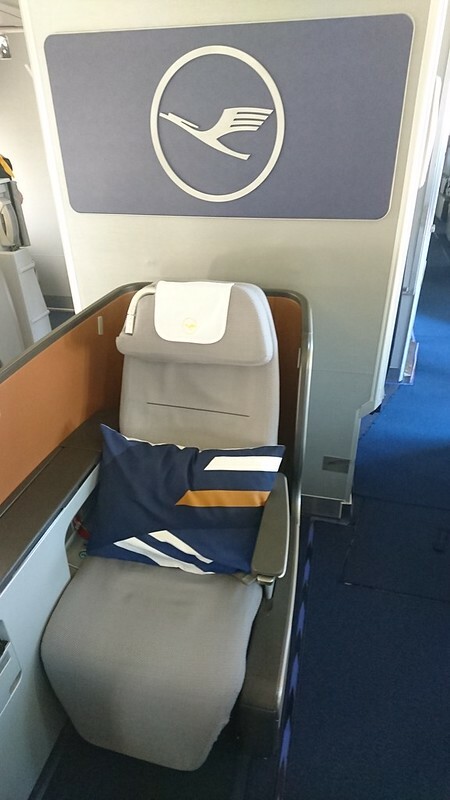 This would be my first flight in Lufthansa's unique Business Class seats, not shared with any other carrier. 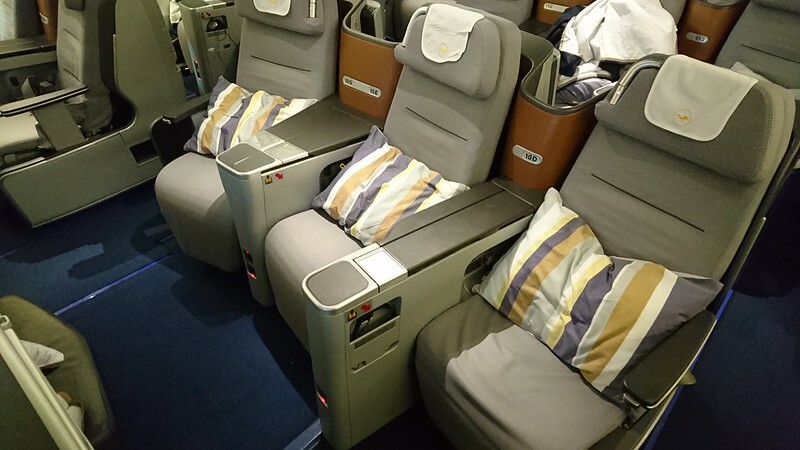 Lufthansa introduced their Business Class flat-bed seats on the 747-8 with what is now referred to as 'footsie class.' Each pair of 2-2 seats is angled towards each other, with one large shared footwell separated by only a small divider. 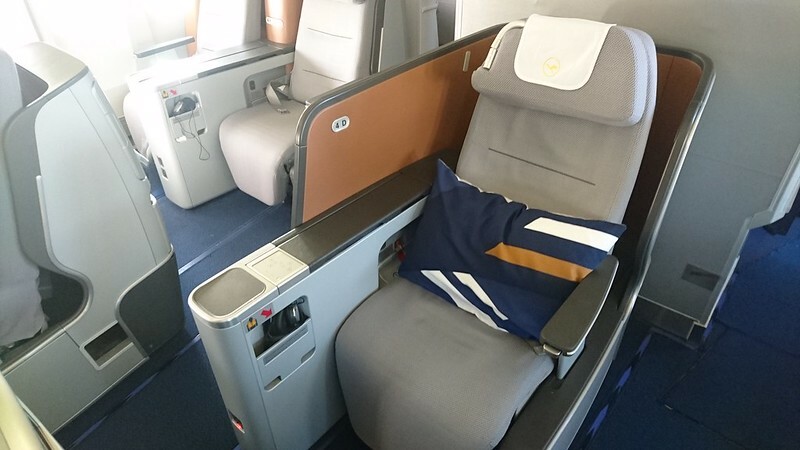 LH has since largely abandoned the layout in favor of a more traditional pair of seats angled in the same direction, parallel to one another, with separate footwells. In the 747-400, though, the 2-3-2 central bank of seats has a combination of the two styles. I was happy in the 'D' seat with my own footwell, parallel to the middle 'E' seat. But the 'E' and 'G' seats were footsie class, with the seats awkwardly angled towards each other, sharing the footwell with a divider in between. 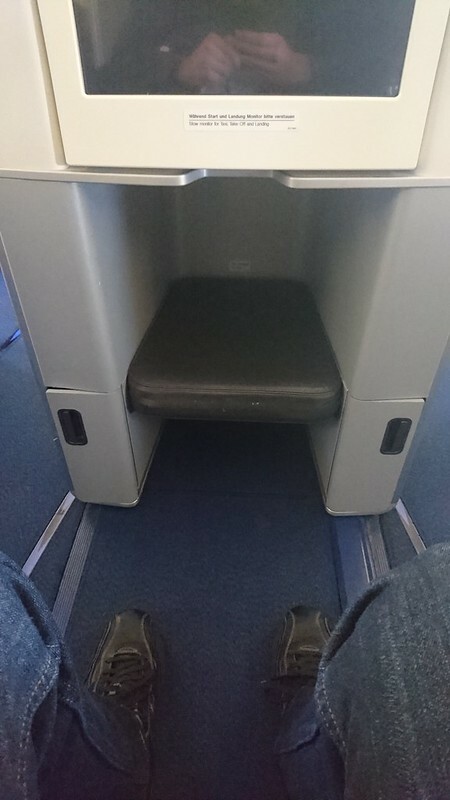 At least the bulkhead row had large footwells and a more substantial divider. My initial thought, though, was that it wasn't a very good design. We'll see how I like it when I get to try out the original footsie class on my return flight with the 747-8. The center bank of seats was situated about 2ft behind the outer pairs of seats for slightly increased privacy, but overall there wasn't much privacy in these seats. There were no privacy dividers between adjacent seats, and the divider between rows was not even as high as the headrest. And the 2-3-2 layout felt very crowded. 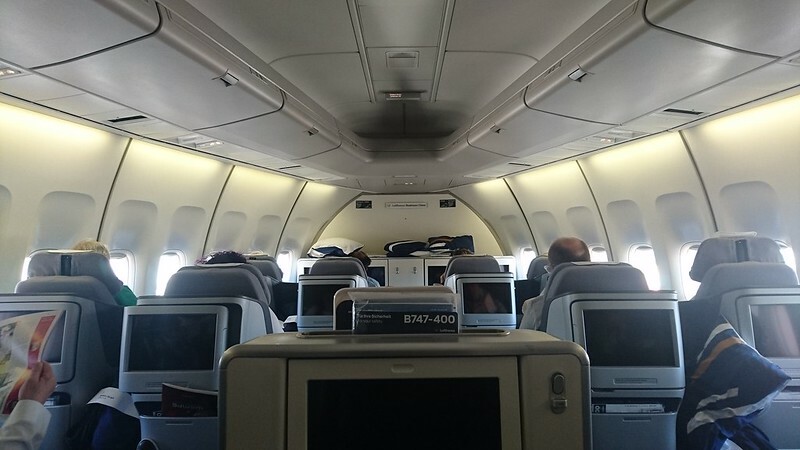 Because the nose cabin ahead of me was also Business Class, there were no curtains to separate the cabins. I could see forward, right into the nose cabin. 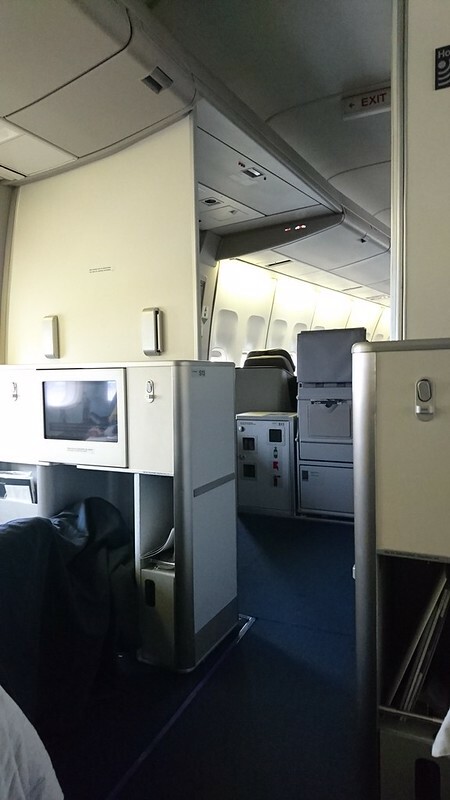 Just ahead of my bulkhead seat were the two restrooms, whose doors opened on either aisle, not toward the front. Fortunately they were far enough ahead that the proximity to the restrooms did not end up being bothersome. Settling in, I noticed the jet bridge had already been pulled back and the door shut. 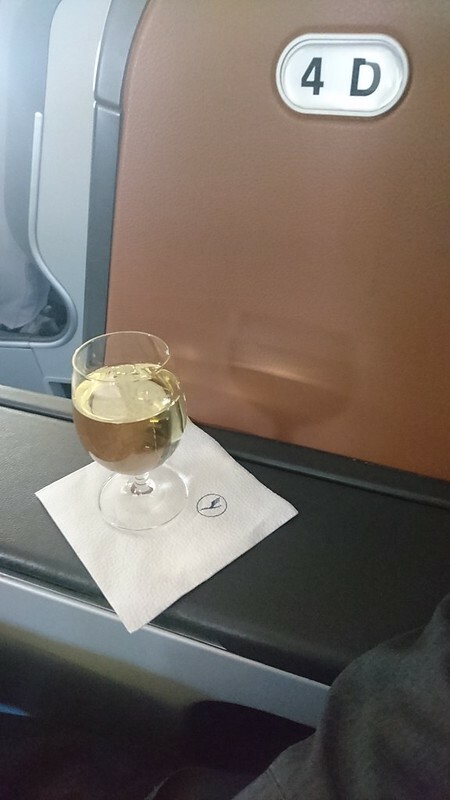 Pre-departure beverages were offered from a tray of water, orange juice, or sparkling wine. I took a sparkling wine, and then menus were distributed. "Herzlich willkommen an Bord unseres Lufthansa Boeing sieben-vier-sieben vierhundert auf dem weg nach Frankfurt am Main!" I checked out the IFE. I found an interesting selection, but the system already said only 7h19 remaining to Frankfurt, so I didn't plan to watch anything on this flight. The purser welcome message occurred as we pushed back at 16:15. The safety video began, first in German, and a second time in English. Takeoff was at 16:27 from 4R. As soon as we finished turning onto the runway, thrust was already increasing. It was quite an average 747 takeoff, not too loud, not too much acceleration, not too much pushback into the seat. After liftoff the IFE displayed 7h10 remaining. My flight attendant arrived to serve nuts and to take drink orders. Beers on offer were Warsteiner, Erdinger Weißbier, and Erdinger Alkoholfrei. A huge fan of German beers, but not usually a fan of wheat beers, I thought I'd give the Erdinger Weißbier a try. 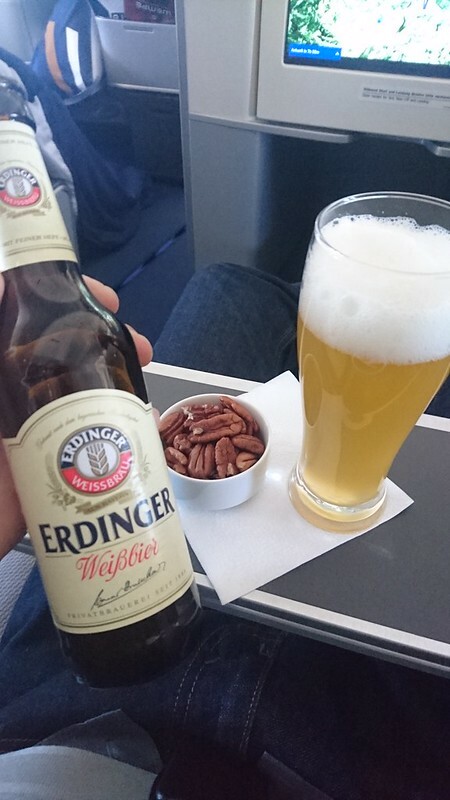 Well the flight attendant ended up serving me the Erdinger Alkoholfrei, even though she had correctly repeated my order back to me. Not someone to normally drink alcohol-free beers, the alcohol-free Erdinger turned out to be very interesting. It tasted fine, with no wheat beer taste whatsoever; instead it tasted only of barley malt. The beer was actually pretty pleasant. The best way to describe it was that it tasted like a German beer brewery smells if you visit the brewery. Definitely unique and not something I'd had before, so I actually didn't mind getting served this non-alcoholic beer. The nuts turned out not to be a mix like I was expecting, and instead consisted of only walnuts, which are among my favorite nuts. Once the nuts and drinks were finished being served, the flight attendant came back for meal orders. My choice of appetizer was Seared Scallops Artichoke Salad, the salad course was Seasonal Salad with Jimaca and Tomatoes presented with Dressing, and my entree choice was Yukon Potato encrusted Salmon with Patty Pan Squash, Broad Bean Cassoulet and Potato & Butternut Squash Puree. I also ordered a Warsteiner beer, which ended up being immediately served. 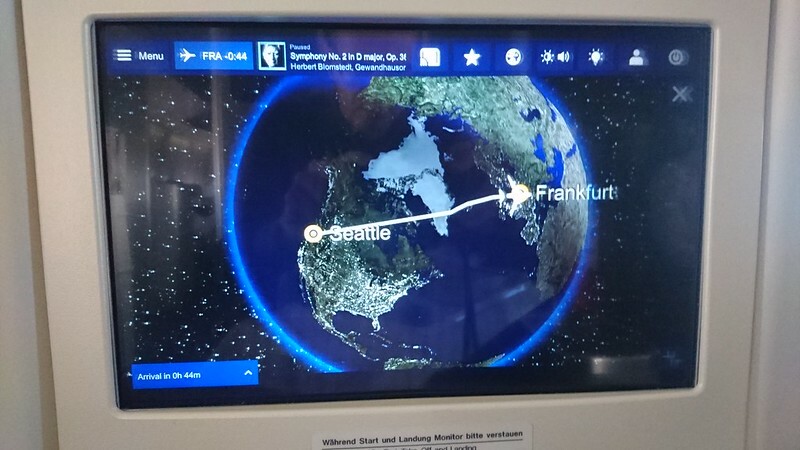 Watching the moving map, we'd already flown past Toronto, leaving approximately the distance of New York to Frankfurt; I guess departing from Detroit added about an hour of extra flight time. I took a quick restroom break before the meal service. I found a clean bathroom with a fresh flower, a nice touch. It also had a sensor faucet and was larger than some 744 restrooms. The appetizer was decent, and I liked the presentation. Both rolls were quite tasty. And while Warsteiner is perhaps nothing special, I like it all the same. The salad served next. 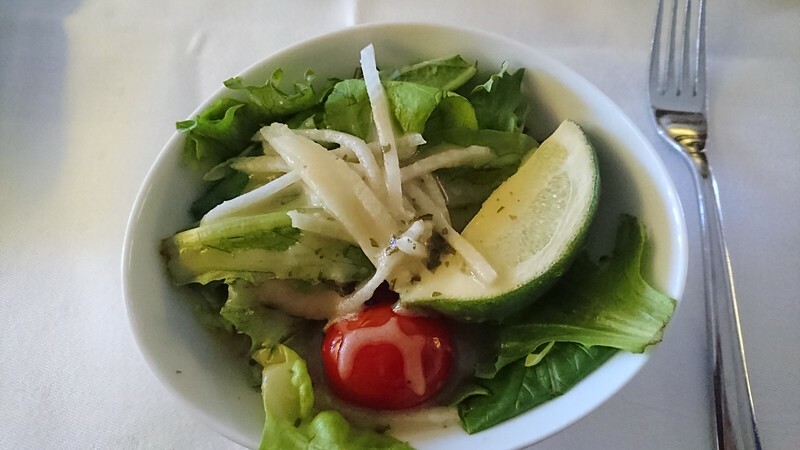 The salad was very good, with an interesting ingredient of a lime wedge. I liked the salad; it was too small in fact. I'd hardly finished the salad, and the entree was already being served. 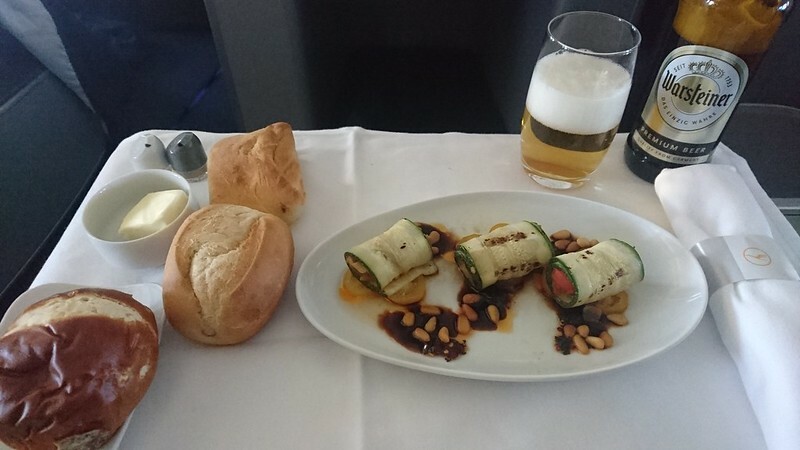 I found it to be pretty good; I'd say a typical Business Class entree. For dessert, I ordered Berry Crumble with Raspberry, along with another exclusive German product, Jägermeister. Wow, the dessert - served cold - was incredibly delicious! 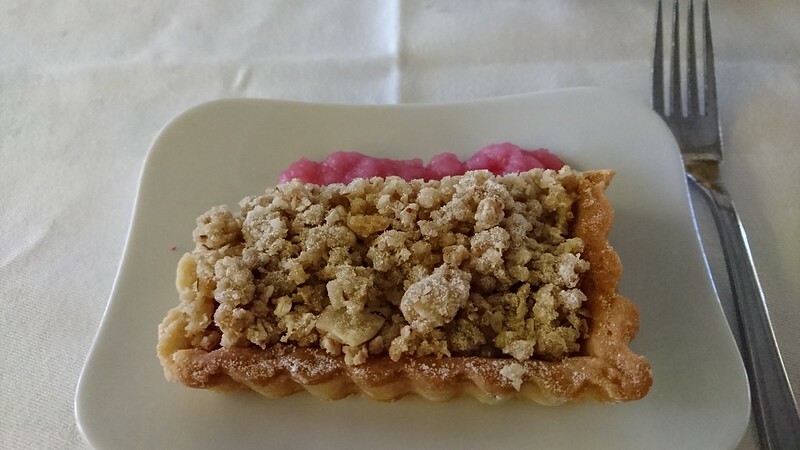 One of my top airplane desserts for sure. It was smart of them to save the best part of the meal for last, leaving me with a positive overall impression! I really liked the dessert! As we left Canada to begin the trans-Atlantic crossing, we unexpectedly hit some pretty good turbulence. As the captain explained, we were one of the first trans-Atlantic flights of the evening, so we didn't have advance warning of the turbulence from any prior aircraft. 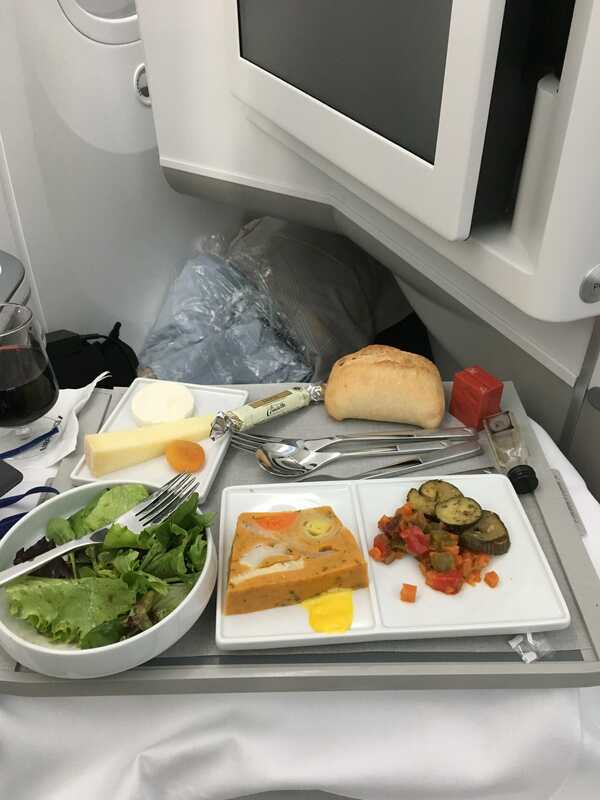 The turbulence delayed the collection of service items, and led to everyone holding their glassware lest they tip over and spill! I was ready to try to sleep as soon as the turbulence concluded and my table was cleared. We had 2,800mi (or 4h45) left in flight. The time was 18:55 (00:55 European time), and our predicted arrival time was 05:40. Despite waking up earlier than 03:45 to catch my positioning flight from Newark to Detroit, I didn't feel particularly tired, considering it wasn't even 19:00 yet. Nevertheless I reclined into bed mode to get some shut-eye. I woke up at 22:15 (04:15 European time), with 700mi (or 1h30) left in flight. We had just passed Ireland. Wow, that wasn't bad. I'd slept more than 3h, the max possible for this flight length. It was very weird, though; when reclining to sleep I hadn't felt tired, and then as I slept, I felt like I wasn't sleeping very well at all. Turns out all those feelings were false, because I slept through the night. The bed had been decent. I would say it was just long enough for me, with typical Business Class bed width. It was pretty warm overnight, but it wasn't a problem as I just didn't use the blanket. I was really pleased with my unexpected full nights' sleep. Even with only 3h of sleep, I felt amazingly awake and refreshed. And I was even ready for breakfast, unlike usual for me. The flight attendant offered the breakfast tray, which I accepted with orange juice and water. 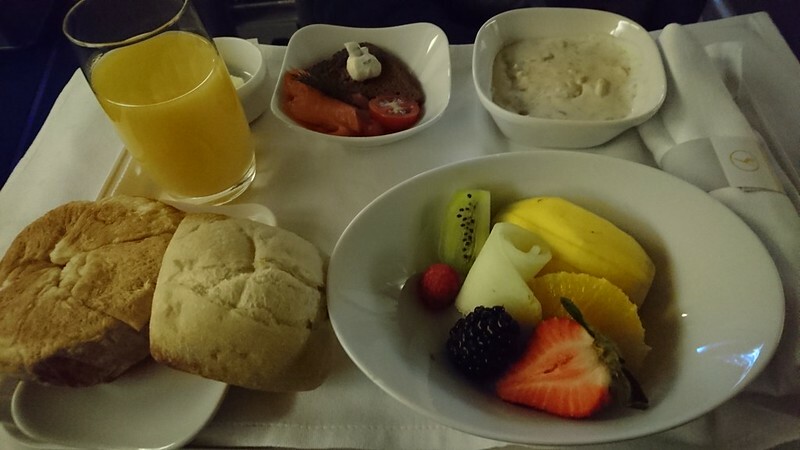 The light breakfast on offer on this flight was just my speed with good bread and fruit. With about 35 minutes to go, we flew right over Brussels, the final destination of my trip. My ICE train would be departing Frankfurt Flughafen Fernbahnhof at 08:43 to take me to Bruxelles-Nord. I'd have a couple relaxing hours in the LH arrivals lounge before catching the train, a pretty good itinerary. The captain's welcome message advised 30 minutes to go, for an on-time arrival as promised. The weather was 12 degrees C, or 55 F. "I hope you got some sleep during our short night, and I thank you very much for choosing Lufthansa for your flight!" We landed to the west at 23:43, and arrived to Gate Z25, Terminal 1, Z Concourse, at 23:47. 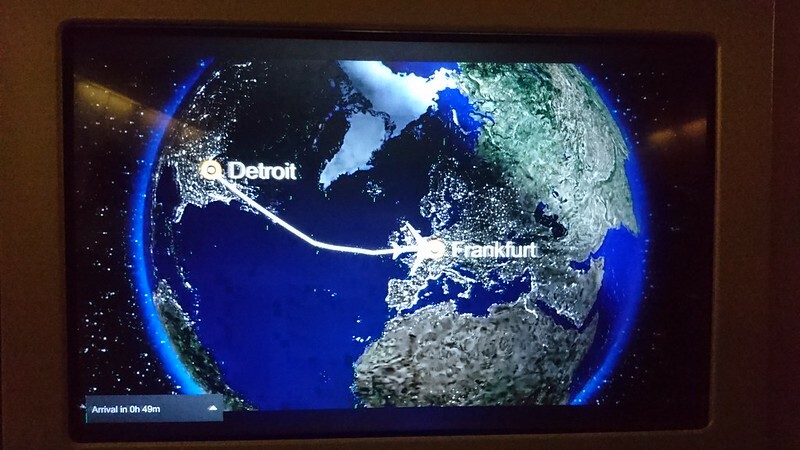 Now that was a very unusual overnight flight, and the first time I think this has happened for me: If you don't account for time zones, we departed Detroit at 16:15 and arrived to Frankfurt at 23:47 - departing and arriving on the same day - that's not an overnight flight!! We were at the gate at 05:47 local time, with my onward train connection due to depart at 08:43. This was my first time flying into Frankfurt Terminal 1. My arrival into the Z Concourse was pleasant, with no line at passport control. It seemed like most passengers had onward flights, plus we were one of the first arrivals of the day. I even beat the bags to baggage claim. I had plenty of time for the arrivals lounge and then my train connection. 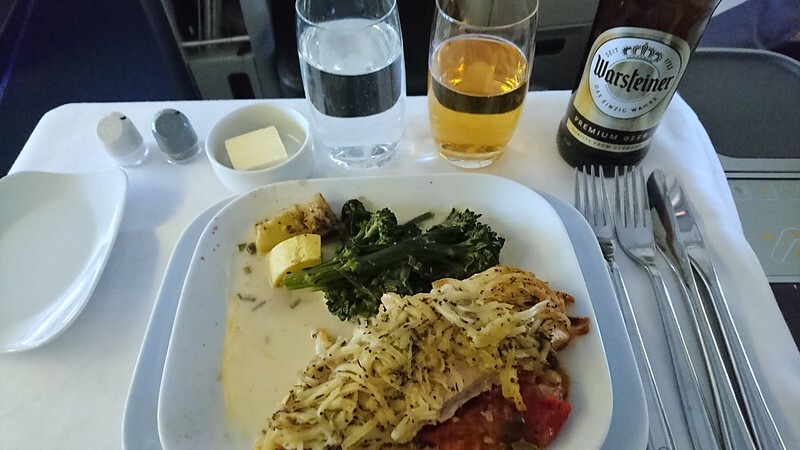 My first Lufthansa longhaul Business Class experience had started out slow, with the inability to secure an advance seat assignment, and then the poor boarding experience in Detroit, but it had consistently improved throughout the entire flight, and I was left satisfied. The service was fine, but my flight attendant seemed not as good as the flight attendant I observed on the other aisle, who had introduced herself to her passengers, greeted them by name, even held a short conversation, and of course taken orders in advance. My flight attendant hadn't done the same, providing only base levels of service. The food didn't really stand out, but I had enjoyed it - particularly the dessert - and the breakfast had been just what I was looking for. The seat was not industry-leading, but had been comfortable, and made for a good bed, and I still can't believe I slept so well for so long. And with a flat-bed seat, what more can you want? What more can you want, indeed, considering I was able to fly on my favorite plane. 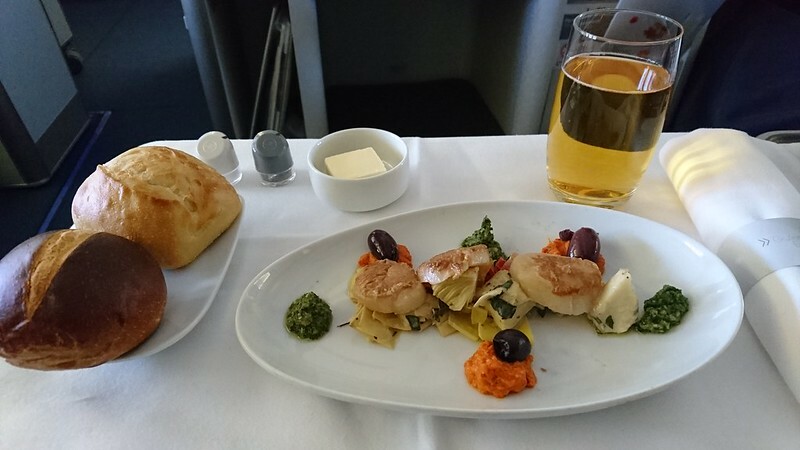 Every Business Class flight is to be appreciated, and all the more when it is on the Queen of the Skies. So while my first Lufthansa longhaul Business Class flight might not register as one of my best flights, I can at least report that my return flight (FRA-EWR on the Lufthansa 747-8) and my next Lufthansa 747-400 flight (below) were both outstanding, with excellent flight attendants, better service, and even better food. 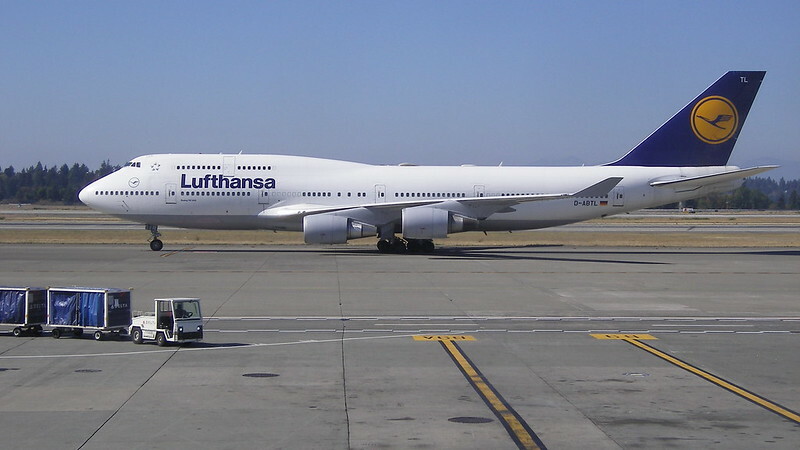 Overall, then, I was left looking forward to my next Lufthansa flights later this year on the 747-8 and the 747-400...a pretty good year with so many 747 flights! Last edited by Tesla on Mon Dec 03, 2018 7:20 pm, edited 1 time in total. 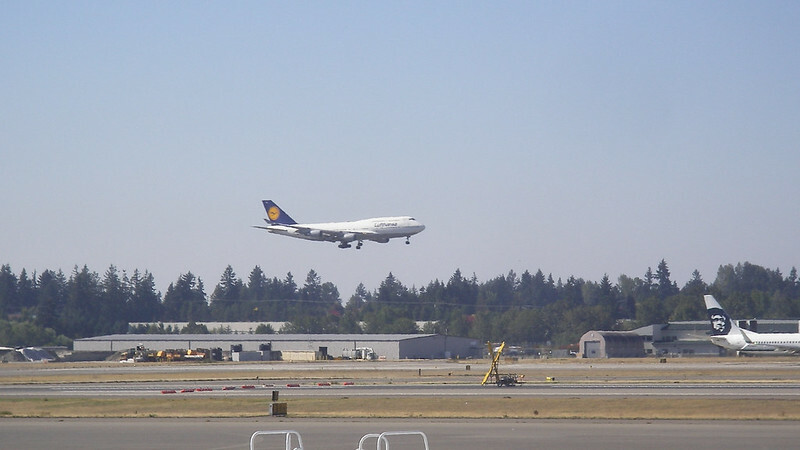 In Seattle I headed to the Lufthansa check-in area for an in person check-in. Interestingly, last time I flew the LH 744, DTW-FRA, I had taken the ICE train directly from the Frankfurt airport to Brussels. This time I am again flying the LH 744 to Frankfurt, and my final destination is again Brussels, but this time instead of the train, I'm flying FRA-BRU on Lufthansa Cityline on a separate LH ticket. At Seattle check-in I intended to ask the agent to check my bag through to Brussels, but before I had a chance to ask, she was offering to do so, having already seen my second itinerary on the computer and not needing to see any print-out evidence. Very nice. I was quickly checked in, my bag checked through, and even issued both boarding passes on the classic yellow LH card stock. Unlike my prior LH 744 experience where I received Precheck, I did not receive it this time, so I headed to the premium security lane. After a delay, all passengers were given the Precheck treatment making for a quick security check. I was airside at 11:00. Boarding was set for 13:15 and departure for 13:50. My incoming aircraft was due at 12:00 according to Flightaware, so part of me was expecting a slightly delayed departure. My scheduled arrival into Frankfurt Z Concourse was 08:48, and my flight to Brussels was scheduled to depart A Concourse at 11:25. This particular flight (an overnight flight longer than 5,000 miles on the 744) was exactly what I was looking for. But this particular flight was an overnight flight scheduled to leave at 13:50 - that's only early afternoon, not a prime time for sleeping on an overnight flight! However I had slept only 1h the previous night, so I was expecting to be able to fully take advantage of the long flight and get a good sleep. Of course the early departure time is needed to arrive in the morning bank of arrivals in Frankfurt, something actually important to me due to my connection to Brussels. My aircraft landed at 12:25 and then took about twenty minutes to arrive to the gate. My aircraft today was D-ABTL, a Boeing 747-400 dating to 2002. After watching the Queen arrive, I went to the lounge. The contract lounge, the Club at SEA, was at Gate S9 and my boarding gate was S15. Shortly after my arrival to the lounge, an announcement advised that boarding was delayed until 13:50, our previous departure time. No surprise there, you can't turn a jumbo jet that quickly. I expected to make up the short delay once in the air and arrive more or less on time. I was very excited for this flight. Almost six months after my prior LH 744 out of Detroit, it was time now for my second LH 744 flight, with an additional 1,000 miles vs. Detroit. My flight this time was booked through LH directly, affording me free advance seat selection. Booking eight months in advance, I was able to snag seat 4D, the one and only solo seat, and I was thankful the aircraft didn't change in the meantime, seeing as how the 744 was my primary objective. 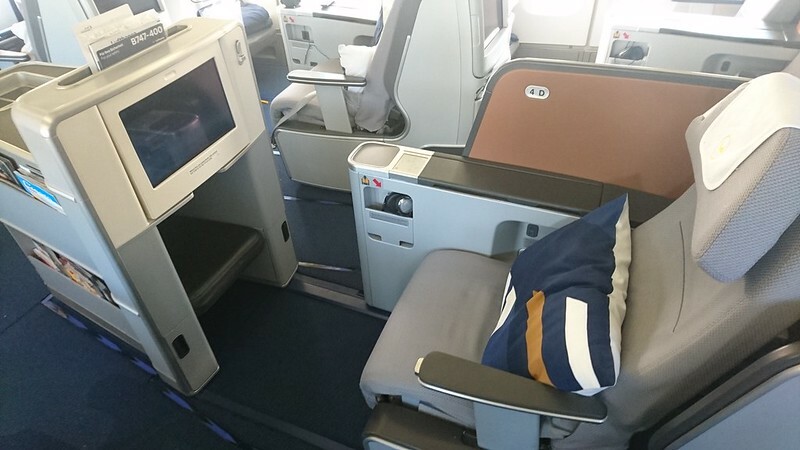 I was a little disappointed to be missing out on the upper deck LH 744, as I do enjoy that every time, but I was very happy to have the LH throne seat, and flying in the nose is just as good and unique as the upper deck. I left the lounge at 13:30. The boarding gate was displaying a 13:50 boarding time and a 14:15 departure time. There were six queues set up: first class, business class, premium economy, and three for economy by row. 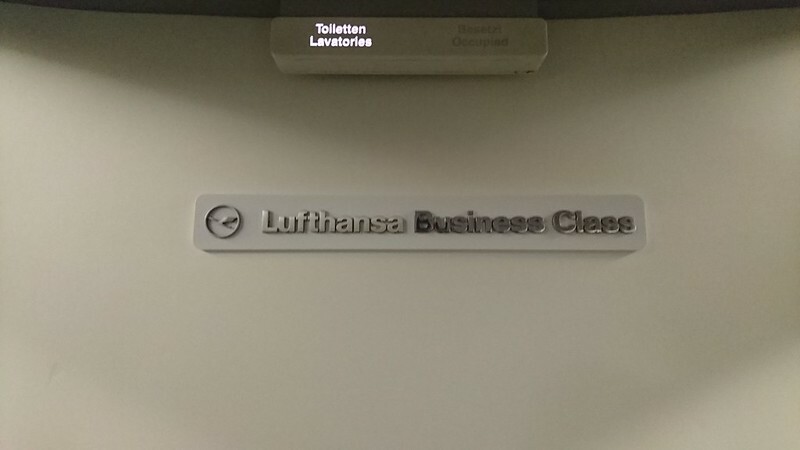 The LH 744 doesn't have first class, so that lane ended up being for pre-boarding. I joined the queue for business class. The crew boarded at 13:35. An agent was moving throughout the queues weighing carry-on bags, a complaint I had read about LH Seattle online, now verified. Several CBP officers were stationed ahead. An announcement advised that CBP was conducting a biometric exit procedure where a photo is taken, compared to your passport, and exit recorded. As pre-boarding began at 14:00, the departure time quietly updated to 14:40. Passengers with infants or small children and those needing special assistance or extra time were invited to pre-board. Business class, LH Senators and Star Alliance Gold were next, but the process moved quite slowly. After only about a third of the group had boarded, premium economy was invited to begin boarding. It was overall again chaotic boarding for LH. Even six queues couldn't make it orderly. I was finally onboard through L2. I turned left to head up into the nose to 4D, the solo throne seat, probably best in the plane. The Lufthansa 744 has 17 seats in the nose, vs 15 in the nose of KLM 744, because KLM has three solo seats instead of one on Lufthansa. Consequently, the nose did feel a bit crowded, but so did the main deck J cabin between L1 & L2. But in my case, with a solo flat-bed seat, with dual direct aisle access, easily able to see out the windows on both sides of the plane, it was definitely a good seat. 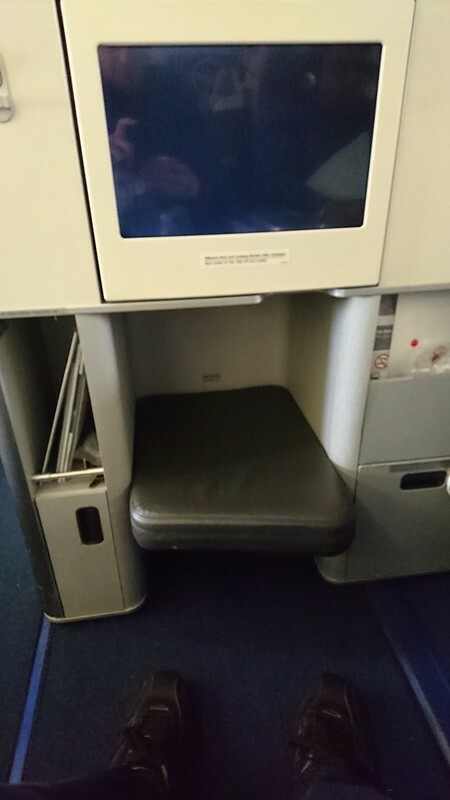 There was a large armrest to my right with a small privacy wall, and then the regular armrest to my left, which could be lowered for additional space while sleeping. I had a good size footwell, with some storage space underneath, and an additional small storage bin under my large armrest to the right. The seat was stocked with a large pillow in a stylish new pillowcase, a blanket, headphones, and in a small compartment under the foot well, the amenity kit and a bottle of water. During my last LH flights, I was already able to get by speaking German, my foreign language in school, but since those flights, I took three months new online German class, so I was feeling confident and wanting to speak German on my flight, a true benefit for me of flying LH. My flight attendant arrived, and as usual on LH, asked, Deutsch? English? "English ... aber ich habe deutsch in der schule gelehrnt, und ich möchte üben..." The flight attendant immediately began conversing with me in German, very nice! 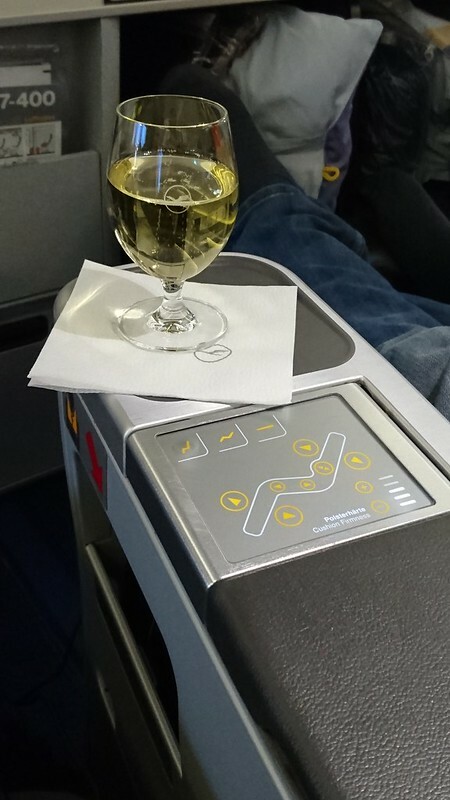 I chose sparkling wine, or sekt, as my pre-departure beverage as I settled into my throne seat. The captain welcomed us on our Boeing 747 to Frankfurt. We were expecting a short flight time of 8h50, meaning we should not be very late on arrival. 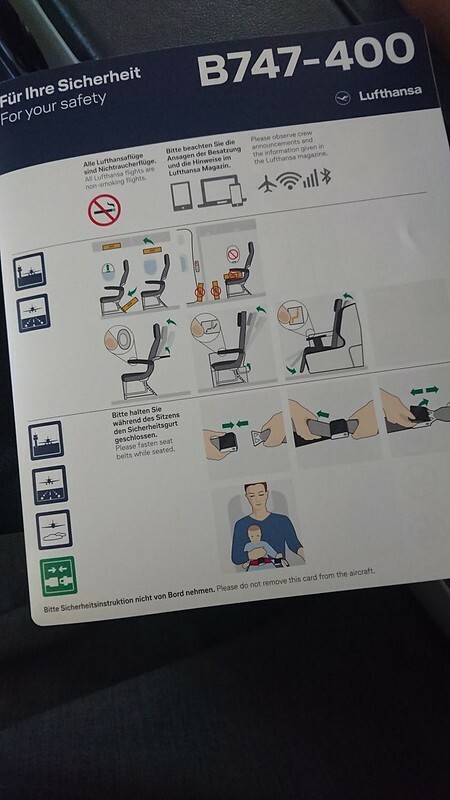 The safety video was played, first in German and again in English. Pushback was at 14:48. We had a quick taxi from the end of S Concourse to 34C. Takeoff was at 14:57. I had good pushback into the seat consistently thru the entire roll, and felt good power. Upon liftoff, it became very quiet in the nose, pretty far from the engines. I could truly hear only vent noise. Perusing the menu, I noted the new addition of Warsteiner non-alcoholic, giving a choice now of two beers and two non-alcoholic beers. I decided to begin with Erdinger, followed by Warsteiner. 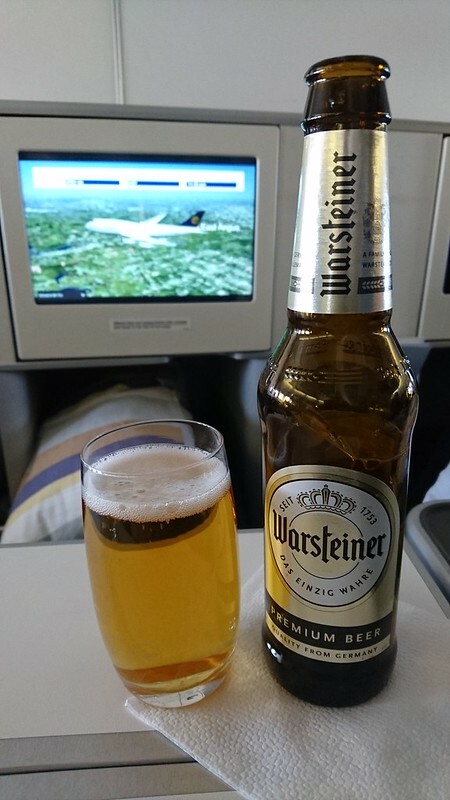 I don't normally like wheat beers, even German ones, but I wanted to get all the LH beers during my LH Mission: 747. And I was already yawning right after takeoff, leading me to think that I'll get a good sleep despite the early afternoon flight departure time. I turned on the IFE and saw we already had under 8.5h to go! It's so difficult to get a long trans-Atlantic flight! 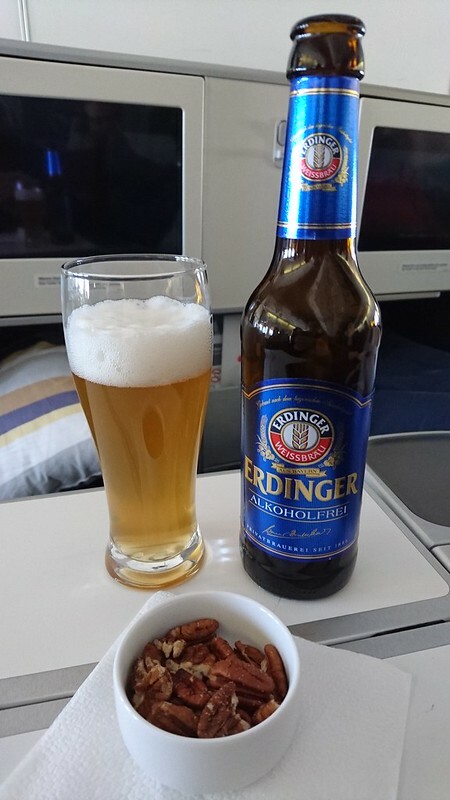 My Erdinger was served with nuts, and I'm pleased to say the Erdinger was very good...maybe because I'm on a 747... German beer is my favorite in general so I'm glad I got to have this beer onboard. Meal orders were taken. My appetizer was Zucchini Eggplant Caponata Roll. Surprisingly the spring roll appetizer, Chicken Spring Roll, Daikon Sprouts, Peanut Dressing ran out very quickly and several passengers, including me, had to pick something else. Fortunately my "second choice" appetizer was actually very good! I asked for one of each type of bread roll, and all three were each excellent. 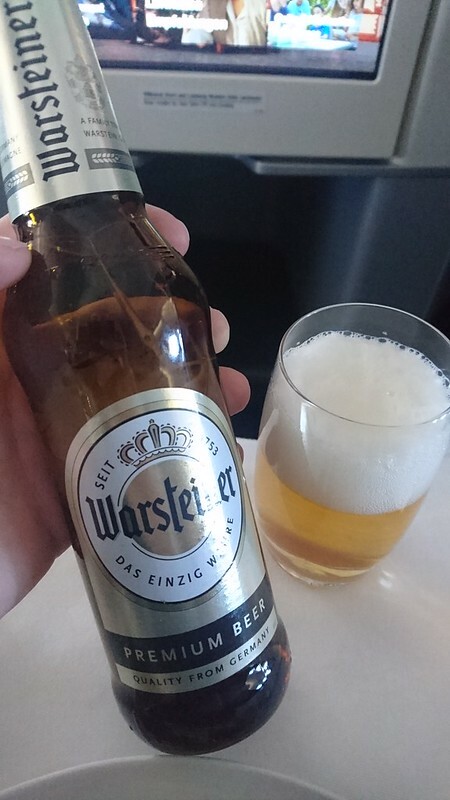 And I went with a Warsteiner for my second beer. 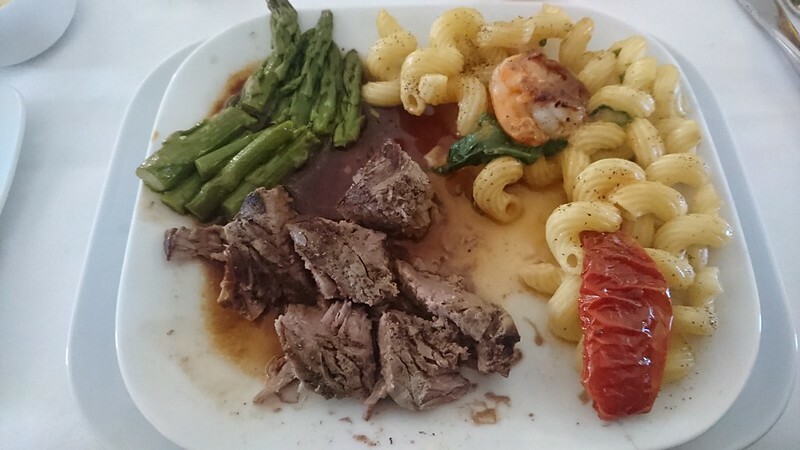 My entree was Grilled Beef Filet, Shrimp Mac-N-Cheese, seasoned Asparagus. Honestly none of the entrees had really captured my attention, but the entree ended up exceeding expectations. 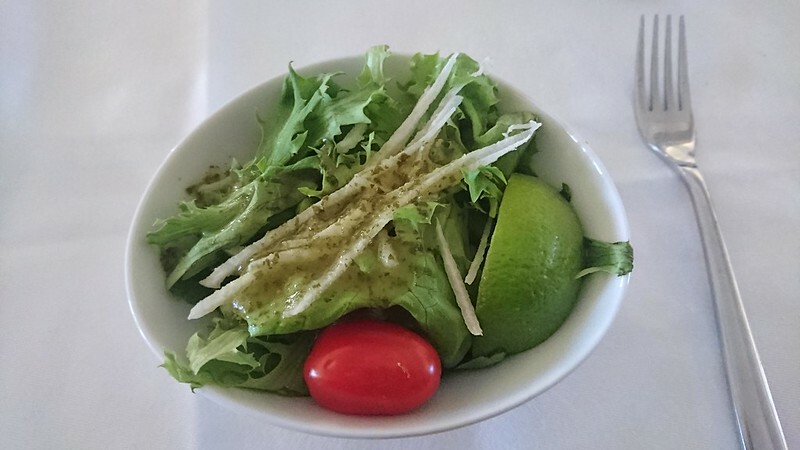 The salad, Boston Butter and mixed Lettuce, Julienne Jimaca, Lime Wedge, Red Grape Tomato presented with Dressing, had been forgotten, but having been a fan of prior LH salads, I requested it and it was immediately brought out. It looked like the same one from my last 744 flight with the interesting addition of the lime wedge. 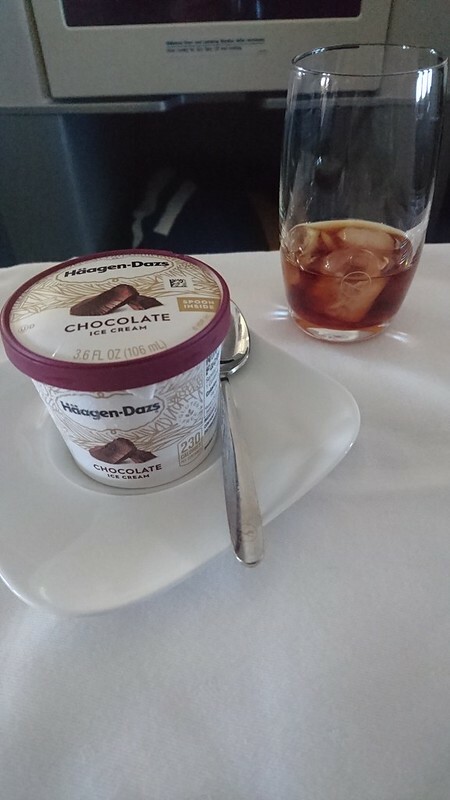 Dessert was chocolate ice cream, and just like last time, a Jägermeister, perhaps a new tradition on LH overnight flights. The meal service finished with 1,000 miles down, leaving 4,100 miles to go, the exact distance of DTW-FRA earlier this year. We had 6h30 to go, and it was 17:15. The cabin was not yet dark, considering the time of day, and not many window shades were closed, but for me, it was time to go to sleep. I immediately fell asleep and slept very well until 22:05, so just shy of 5h. We started hitting a bit of turbulence right around the same time I started smelling food, and then the lights were turned on. We had 1.5h, or 900 miles, to go. We were just north of the United Kingdom. The bed was a very good length and comfortable, and I had no complaints about the width. I felt like the 5h of sleep was the perfect amount, and therefore the 5,000-mile segment was the perfect distance. I was well-rested and happy for having chosen this nice long flight. Hot towels were immediately brought out, and then breakfast began being served. 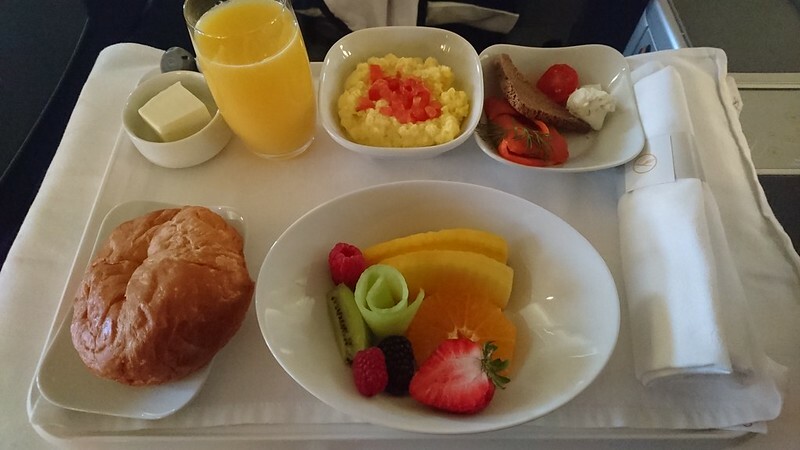 Just like last time, LH offered just the type of breakfast I was looking for: Fresh Orange Juice, Fresh Fruit, Smoked Salmon with Dill & Pepper Cream Cheese, and Scrambled Eggs with roasted Tomato. The captain announced that we were just crossing the Dutch border, so we would be beginning our descent. We flew as fast as possible, with a shorter flight time than expected, but unfortunately will not arrive on schedule. We will be perhaps only a few minutes late, though, so there should be no problem with connecting flights. Frankfurt is 6 degrees and hazy. I relaxed, listening to music the rest of the flight. Our landing was at 23:43, and we were on-stand at 23:48, meaning just like last time, it's an 'overnight' flight which actually departed and arrived on the same day, not counting time zones! But we'll make that 08:48 European time. Parked on-stand at a bus gate, and I was the last to squeeze into the first bus. I enjoyed deboarding the 747 down the stairs for the first time. I made it into the terminal by 09:05. 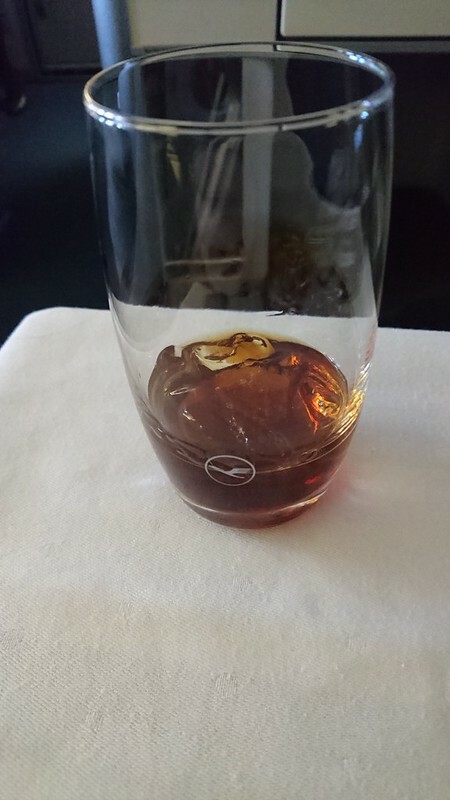 It was a very good flight, and overall I was highly satisfied. I enjoyed the food on LH. 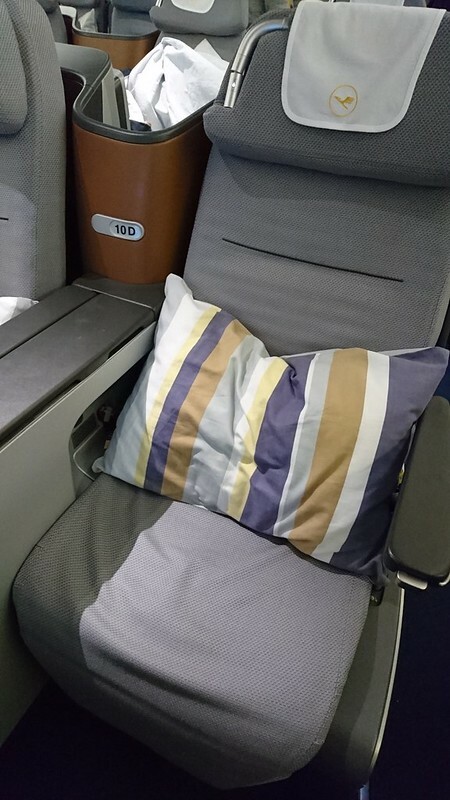 The seat is comfortable and offers a long-enough bed for me, enabling good sleep, and despite not being a class-leading design, you can't beat a solo throne seat in the nose of the 747! 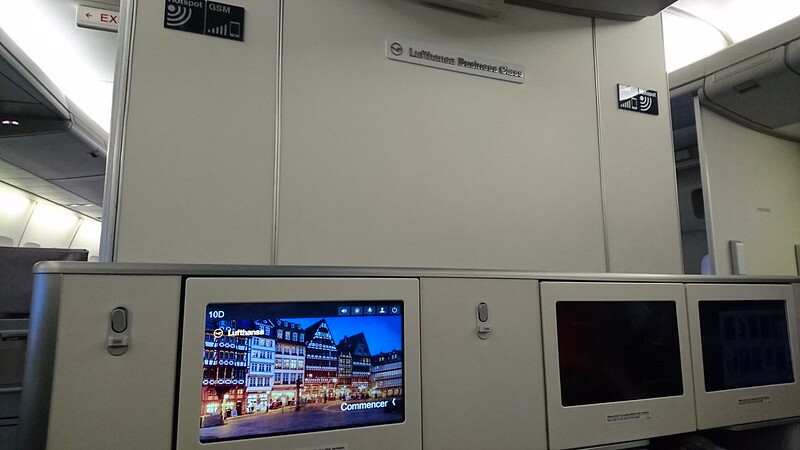 Plus, for me, personally, I really enjoy the German airline of Lufthansa so I can hear and practice the German language. 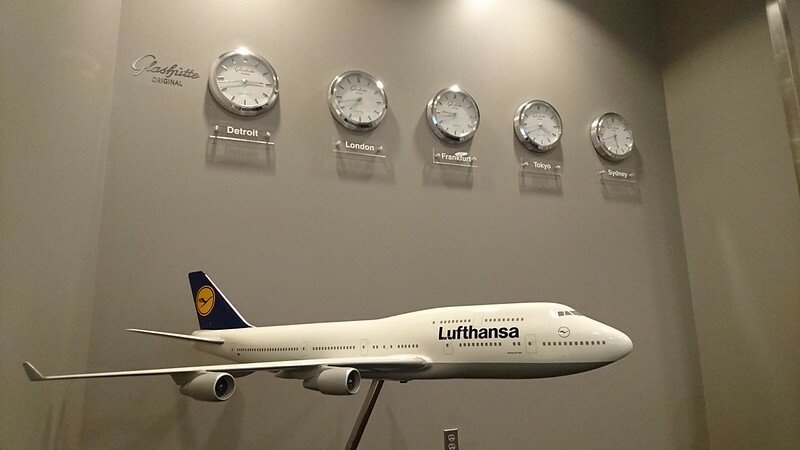 And considering that LH operates the 744 and the 748, there are two excellent reasons to continue to fly with LH! 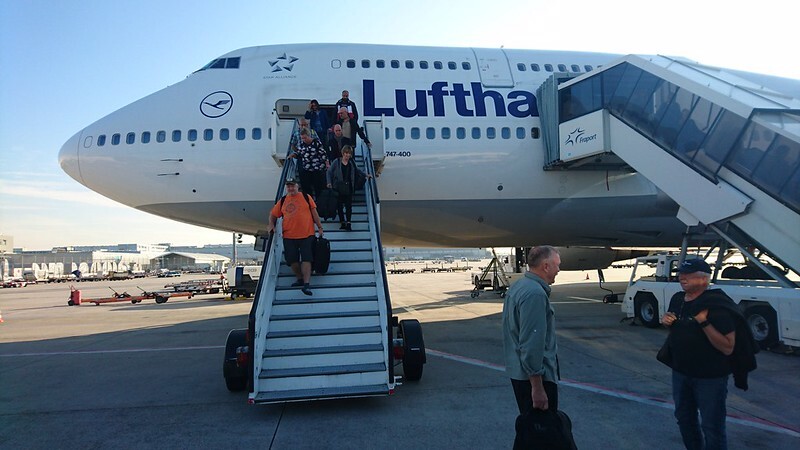 Deboarding by stairs on a 747, you got to love that. While the hard products seems somewhat outdated, the soft product seams good! I flew D-ABTL from FRA to SEA last year! Loved it. Nice reports! I flew out of the DTW North Terminal for the first time last month, having been flying on NW and DL through the McNamara terminal as long as I can remember. Having seen the LH 744 flight come in before I left, I was thinking about the service aboard that flight during my own painfully dull flight on a UA CRJ. Thanks for satisfying my curiosity. That salmon entree looks amazing. Certainly better than the fish I had aboard AF on business from CDG-DTW last spring. It was a teeny piece of whitefish swimming in a pool of 'sauce', which was more like a soup, served with a heaping potion of tarragon polenta that tasted like I was eating pure powdered tarragon. Despite the seating difficulties you described, I might choose LH next time for a better gastronomic experience. Business looks OK but see they now only serve ice cream in Business. Not a fan. Dislike their economy long haul; mediocre legroom and meals. And Frankfurt Airport not pleasant for connections.